Want Students to Watch Videos but Concerned About Distractions and Inappropriate Content? Video is an increasingly important element in the teaching tool set, but we often find ourselves challenged buy the challenges video delivery can suffer from. YouTube remains the king of video content delivery, but if you want to be sure that students are going to be able to access video content that you want them to view, you know they'll be able to get to it on YouTube. Vimeo is similarly reliable. BUT … that being said, the potentially inappropriate content students may encounter on these platforms absolutely IS a concern. Not to mention the distractions of all those videos they work so hard to ‘recommend'. 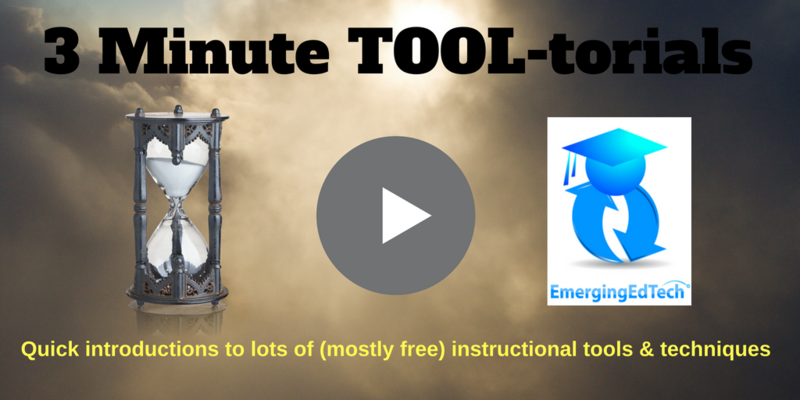 This is the newest in our growing set of 3 Minute Teaching TOOL-torials here on EmergingEdTech.com! I just tried this and experienced a similar issue re: sign in via Google doesn’t work. Not sure what the deal is. Sorry for the inconvenience William. I’m trying to sign in with my google account on SafeShare but it isn’t letting me. It keeps saying an error has occurred. That and everything on the sign in page grows to 5x the normal size. Why is that? Thanks Dave. We certainly don’t want to encourage copyright violations, but I am not under the impression that SafeShare.tv downloads the videos. I need to look into this further. Thanks for sharing your concern. Any video which is under copyright, as most YouTube videos are, can not be uploaded to safeshare.tv without the user facing statutory penalties at the very minimum.